Listen to an interview with Doris Kearns Goodwin on The Bob Edwards Show. ©2005 Blithedale Productions, Inc. (P)2005 Simon and Schuster Inc. All rights reserved. If the focus, in the printed book, is on the team of rivals that Lincoln selected for his cabinet, that focus is almost entirely absent in this abridgement. It starts out promisingly, with some interesting material on the fight for the Republican nomination in 1860 -- we get fascinating glimpses into the men who would lose to Lincoln, then serve him in his cabinet. That's about 45 minutes ... From that point on, the audiobook is basically a decent overview of the course of the Civil War, with little insight into how these rivals influenced Lincoln's governance. If you haven't done much reading on the Civil War, this abridgement could serve as a good place to start. If, however, you were looking for an in-depth view of Lincoln's cabinet and its impact on his Presidency, you may want to wait for the unabridged version. On a side note: The narration was excellent throughout, apart form a brief intro by the author, who may have been caught on a bad day. 31 sur 31 personne(s) ont trouvé cet avis utile. I try to avoid abridged editions, but was so eager to "read" this one, that I got this version accidentally - and then realized that there isn't an unabridged one. The abridgement is neither seamless nor smooth - for example, stories of Lincoln's youth are referred to, but never told. The reader/listener can "feel" the holes in the narrative. Dang! That being said, it is clear that this is a wonderful book, carefully researched, with creative connections and educational historial parallels (ex - Seward and Rumsfeld taking hits for their President's war decisions). I am loving it, and wishing I could have had all of it. Wait for the unabridged version! 49 sur 50 personne(s) ont trouvé cet avis utile. The introduction suggests this will be a great book, something that really gets into the dynamics of Lincoln's team-of-rivals cabinet. But the abridgement left little more than a bland recitsation of the facts of Lincoln's election, the civil war, and the assasination. The facts were fine, but I was hoping to get behind the facts, into the heads of the main actors. That did not happen. It's my own fault, I assumed this would be unabridged. And didn't bother to check. It's not and the unabridged version is not available. Why on earth would someone want to read only a part of this story? The abridged version definitely leaves one with questions. 31 sur 32 personne(s) ont trouvé cet avis utile. I was interested in the subject matter and have always had respect for the author, but I did not expect the book to be so very good!! Any armchair historial or Civil War buff would do well to listen to this book as it gives a unique picture of Lincoln. The telling of well known stories was fresh and I was surprised to actually learn a thing or two along the way. Very happy with the purchase and would recommend to all. There is one good chapter in this book. The rest is old news, and Richard Thomas' reading is monotonal. Only at the end did I realize that the audiobook is abridged, which is ALWAYS the kiss of death. (I should have looked more carefully before I bought it.) If you can, read Shelby Foote's, The Civil War. It is far more interesting. Superb -- But Why On Earth Abridged ONLY???!!!??? Team of Rivals is a marvelous read, and Richard Thomas is the perfect reader. But I wanted to cry all the way through both parts, because I KNEW I was missing much detail and richness due to the abridging of the work. With each wonderful page of beautifully narrated prose, I felt my heart sinking into sadness that there is no full, unabridged audio book version available. 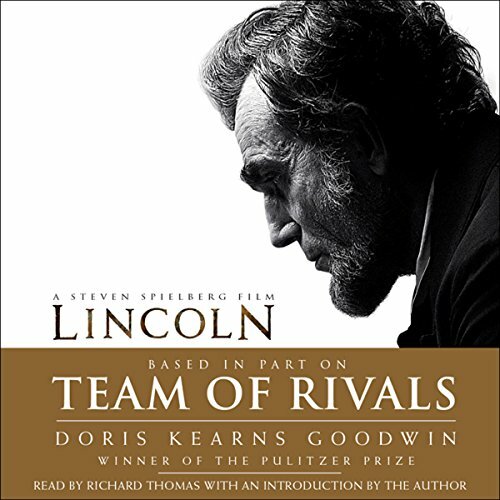 If there were, I would pay double to buy it all over again because Team of Rivals is such an extraordinary contribution to our nation's presidential heritage. Thank you, Doris Kearns Goodwin. Brava!!! An amazingly engaging set of portraits. Other biographical portraits are limited by the attempt to follow a rigid structure of time and events. This book lets the characters of the men it portrays emerge, without being a slave to the calandar. Although it leans towards hagiography, it is solidly based in reality. The portraits of Seward, Chase, McClellan, Grant, and Mrs. Lincoln are richer than I have encountered before. I could not wait to get back to book. I learned things about Lincoln I will never forget. The narrator was engaging, if a trifle excessive. I felt at times he was singing, when the book could have spoken for itself. But I highly recommend this book to anyone who loves biography, Lincoln, or the Civil War. I wish it had been unabridged, as I hated to come to the end. The author has a great knack for pulling out interesting facts along the way. This is a terrific listen, though I really wish it had been unabridged. There were times I wanted more information. This book is great just to fill in why the "Team of Rivals" description is being applied to Obama. It was impossible not to weigh what I was listening to with current presidential events. It seems that the more solid comparison is their common introvert thinker characteristic. Whatever the case, this certainly added to my understanding of Lincoln in a new way. I thought enough had been written on the great man. However, I really felt closer to Lincoln after hearing the stories, struggles, rivalries sorrows and triumphs of Lincoln and his chosen few on the cabinet. Thoroughly enjoyable and authoritative piece of narrative history.